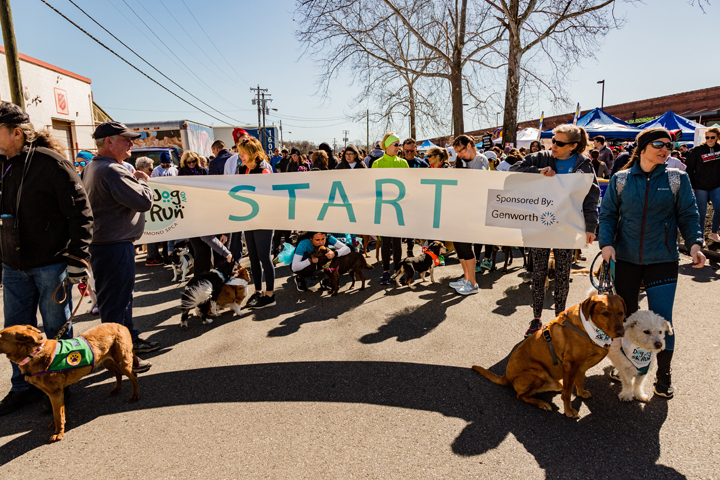 Our 17th Annual Dog Jog and 5K Run, presented by Holiday Barn Pet Resorts on March 23, 2019, raised more than $191,000 to help the homeless pets in our care and to fund the crucial programs and services we provide to our community – all thanks to your generosity! It’s not too late to still make a gift in honor of your favorite participant or team. Donate today! Congratulations and huge thanks to our top team and individual fundraisers! 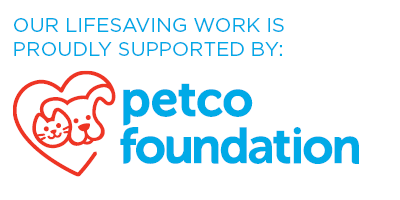 We are so grateful to each and every one of our participants who raised donations in support of the pets in our care. We have special gifts for any individual who raised $250 or more in support of the Dog Jog and 5K Run. Please reply to this message to schedule a time to pick up your gift if you have not already done so! View our complete 5K run race results. Thanks to Richmond Road Runners Club for chip-timing our 5K run! If you were one of the top three finishers in your age group and have not yet picked up your gift certificate to Fleet Feet Sports, you may do so at our Robins-Starr Humane Center front desk during our normal business hours. The Johnny Birkitt Hero Award was established in 2007 to be given each year in memory of Johnny Birkitt, a remarkable and beloved young man who passed away that year and whose family and friends chose to honor his memory by forming a team to participate in our Dog Jog. Johnny was a great animal lover, and the meaningful tribute of those who knew and loved him has continued at each Dog Jog and 5K Run as a celebration of his life. The award that bears Johnny’s name is given each year to the person or team that has displayed the greatest spirit to support animals in great need. 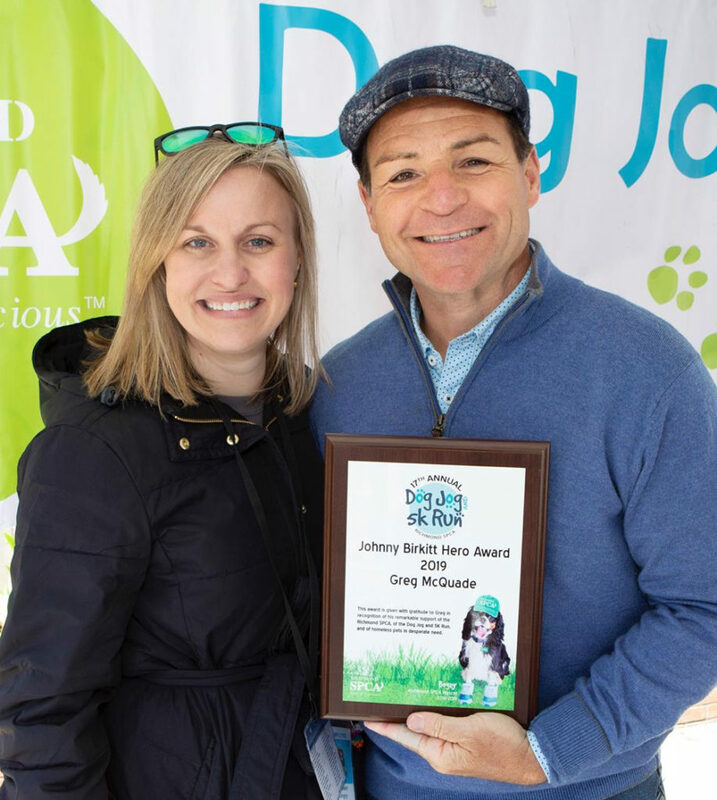 At Saturday’s 17th Annual Dog Jog and 5K Run, we enthusiastically recognized Greg McQuade, CBS 6 News anchor and dedicated friend to animals, as the 2019 recipient of the Johnny Birkitt Hero Award. Greg is a champion for homeless pets and has served as the enthusiastic emcee for the Dog Jog and 5K Run for more than a decade. In addition to contributing his enormous talent to this lifesaving event, he also emcees our annual Fur Ball gala at The Jefferson Hotel every November. Greg, who has adopted his companions from shelters including the Richmond SPCA, can always be counted upon to raise attention and awareness for important issues affecting the welfare of animals. Greg is an inspiration, and we are delighted to recognize him with this year’s Johnny Birkitt Hero Award. Congratulations! The 17th Annual Dog Jog and 5K Run has been well documented in thousands of wonderful photos thanks to our volunteer photographers! Many others have also shared their images from Saturday on Instagram and Twitter using the hashtag #DogJog or tagging us with @RichmondSPCA. If you have photos to share from this year’s Dog Jog and 5K Run, please send a link to your photo set on Flickr or other photo sharing sites to our communications team. You may also post photos and comments about the event on our Dog Jog and 5K Run Facebook page, and be sure to follow us to be the first to know details about next year’s Dog Jog and 5K Run in 2020! Laura Windsor is a member of the Richmond SPCA’s Board of Directors, and is the Chair of our Dog Jog and 5K Run Committee. She is an attorney with Williams Mullen and she and her family share their home with their dog, Harley, who loves participating in the Dog Jog each year.